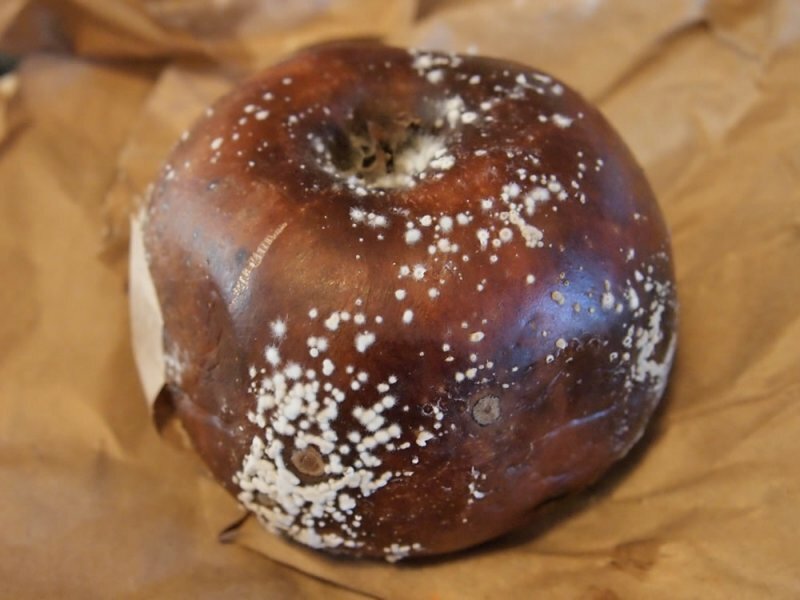 This is a very common fruit rot and has varying symptoms. The fungi Monilinia fructigena and Monilinia laxa both cause brown rotting symptoms, with M. laxa also causing blossom wilt, spur blight and tip wither problems. Soft, brown patches appear on fruits (sometimes associated with damage to the fruit) from mid summer onwards, either while they are on the tree or in storage. The patches grow and can move to other fruits that they come into contact with. White or yellow pustules develop on the browned areas, sometimes in concentric circles and most commonly seen in wet weather. 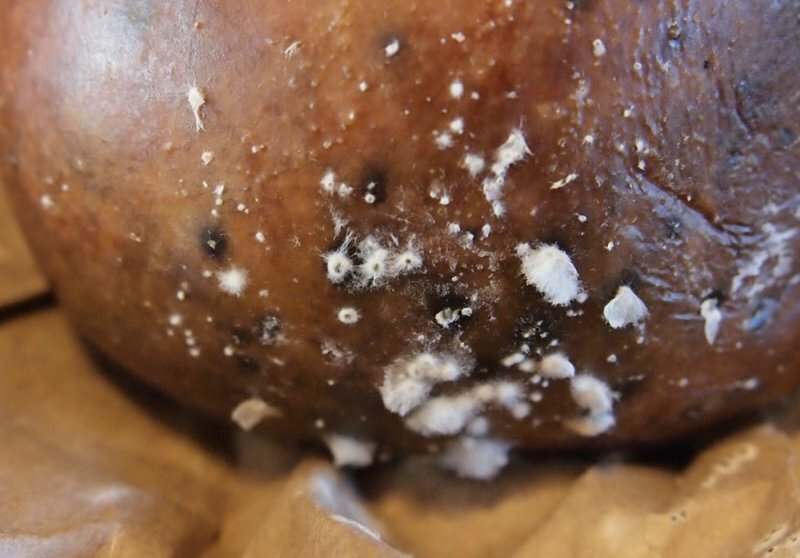 Stored fruits may not develop pustules and may turn completely black. The fruits eventually shrivel and, if they are on the tree, remain there throughout winter. Blossom can also be affected by wilting as a result of the disease. The spur leaves may also wilt, usually a couple of weeks after the blossom has appeared. This can look similar to frost damage. Blight may occur on leaf-bearing stems, causing the leaves to wilt and sometimes extending into the branches. The tips of stems can droop with leaves withering and brown lesions appearing near the base of affected leaves. Small cankers may develop on stems which have been affected by rotting, wilting or blight and this can extend to girdle and kill branches. It is easily spread from tree to tree by wind or insects and enters the fruit through wounds and punctures left by birds, wasps, codling moths, scab infections, weather and other damage. The mycelium spread quickly through the fruit and infect neighbouring fruits, also spreading down the stem to form a canker. It overwinters in the mummified fruits and cankers. The ease of spread can result in a significant loss of fruit, both on the tree or in storage. Rotting of fruit affects almonds, apples, apricots, cherries, damsons, gages, nectarines, peaches, pears, plums, prunes, quinces and sometimes medlars. Blossom wilt affects apples, apricots, cherries (including ornamental varieties), nectarines, peaches, pears and plums. Blight can affect ornamental cherries and plums. Withering tips can occur on almonds, plums and, rarely, on cherries. Fruits which grow in larger clusters are more susceptible as the centre of the cluster will not dry out as quickly as more separate fruits. Some cultivars are believed to be more resistant to brown rot, for example the apple ‘Golden Delicious’ seems relatively invulnerable as do the plum cultivars ‘Czar’, ‘Jefferson’, ‘Ontario’ and ‘President’. Reducing damage by birds through the use of bird netting can limit the potential entry points for the disease. Prune the tree so it has an open habit, allowing good air flow between the branches and therefore keeping the fruit drier. Good general hygiene can reduce the chances of infection. Remove any fruit with rotting areas as soon as you spot them, checking fruit on the tree and in storage regularly, and destroy them (don’t put them on your compost heap). Do not pull the stalks off fruit which you intend to store. Prune out and destroy any diseased or cankered stems in winter. Be thorough as overwintering spores in the fruit and stem will infect the blossom in the spring which, in turn, will produce spores to infect that year’s fruit. Spraying with a fungicide containing difenoconazole may provide some control for cherries, damsons, gages, plums and prunes. Spray trees as soon as the blossom appears, again when it’s at its peak and finally when the blossom has fallen. If you are applying a spring fungicide for the control of other diseases (such as scab) you may find that this also provides some protection against brown rot.